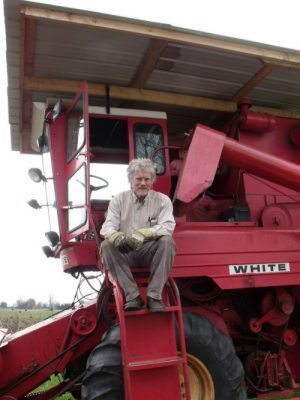 I want to know the date the oil was pressed , the farmer who grew the seeds and see the source of my food so it must be local and organically grown since treating our food, soils and the insect and bird world with toxic chemicals destroys our environment. Our bottles of oil have the date of pressing, the farmers who grew the seeds and the year the seeds where grown. 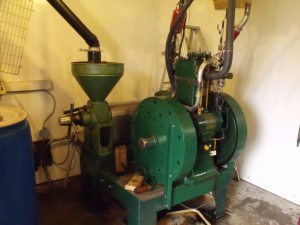 With the help of Wil Arlow I designed and built the machinery used in pressing the oils using older machinery and fabricating what we could not find. The process is efficient and is an enclosed system to lessen exposure to open air. Most of us use vegetable oils for frying, salad dressings, varnishes, massage oils or fuel. 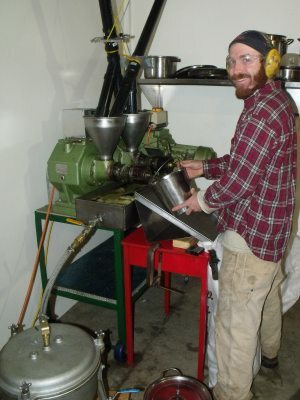 In 2006 and set about to learn the art of pressing oils. Knowing the correct oil for each usage is important. Sunflower oil which is mostly omega 6 is acceptable for light frying, salad ddressings and cooking. 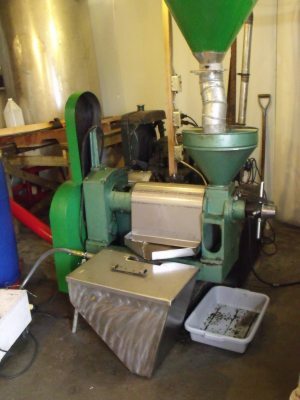 Hemp and Flax oils used for non heating applications, contain Omega's 3, 6 and 9 and hemp oil, also a non heating oil is believed to have the correct ratio for human health. All of the fresh vegetable oils need to be kept in a cool dark place or be frozen to retain nutritional values. When I looked at the grocery store bought oils and discovered how they are produced, I was appalled! Many of the oils produced are crushed, then volatile chemicals are added then later removed by high heat so there is no nutritional value left in the oils. And there is no indication of the source or when it was pressed or which year the seeds were grown!!! Oils from far away lands do no inspire me as there is no date of pressing and I do not know if they were kept in a cool dark place, nor how long it has been since they were pressed nor if the oil is pure. 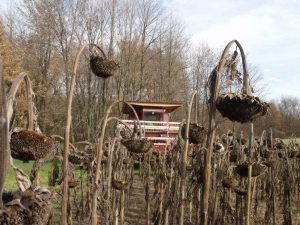 Refining sunflower oil through solvent extraction, degumming, neutralization and bleaching can make it more stable and suitable for high-temperature cooking, but will also remove most of the oil's nutrients and flavor, including color pigments, free fatty acids, phospholipids, polyphenols and phytosterols. Unrefined sunflower oil is less heat stable, but will retain more of its original nutrient content and flavor, and is well suited to dishes that require low- or no-heat. The best away to get nutritional vegetable oil is to cold press the seeds. This means keeping the heat as low as possible as the seeds are being pressed. It is quite an art to keep the press efficient yet cool enough not to keep the nutritional values. Some of the oils produced may have a residue and may look cloudy when fresh but this is only because for small quantities we use a centrifuge to remove most of the fine meal particles. instead of using our large filter press. The important thing you will notice about our labels is the date of pressing, the year seeds were grown and the farmer who grew them. We have been inspected by Canada Food Inspection Agency for producing vegetable oils and also have a hemp license. Where do you keep oils? Heat and light can damage oils, particularly polyunsaturated ones, so keep them in the refrigerator to avoid rancidity. Why does oil get cloudy when it's cold? Some oils, become cloudy or solidified when refrigerated. It doesn't affect their quality at all. A few minutes at room temperature and things will be back to normal. I hear people refer to a "smoke point" when they talk about cooking with oil. What's that? Heating oils beyond their smoke point  the temperature at which the oil begins to smoke, generating toxic fumes and harmful free radicals  is never a good idea. Always discard oil that's reached its smoke point, along with any food with which it had contact. To Refine or Not to Refine? Unrefined oil is simply pressed and bottled so it retains its original nutrient content, flavor and color. And add full-bodied flavor to dishes and are best used for low- or no-heat applications. Fats have had a bad reputation in the past, but people are starting to realize that we need them to stay healthy. Fats are one of the three major nutrients of the human diet. The other two are carbohydrates and protein. So fats are here to stay, and that's a good thing because fats also make a large contribution to the taste, aroma and texture of food  those things that give us such satisfaction when dining. Before we get down to the details on fats and how they work in the body, you should realize that fats and oils are one and the same. The only difference is that oils are liquid at room temperature and fats are solid. Simply stated, triglycerides are the chemical form of fats in food and in the body. Think of fats as a building and triglycerides as the bricks that give it shape. Every triglyceride "brick" consists of a mixture of three fatty acids  saturated, monounsaturated and polyunsaturated (the "tri"), and one glycerol molecule. Thus, the name "tri"-"glyceride." A particular fat is defined by the combination of fatty acids that make up its "bricks." The triglyceride bricks in olive oil, for example, have many more monounsaturated fatty acids than it does saturated or polyunsaturated fatty acids, making olive oil a monounsaturated fat. Monounsaturated fats are heart-healthy because they maintain good HDL cholesterol levels while lowering bad LDL cholesterol levels. They are more chemically stable than polyunsaturated fat but not as stable as saturated fat. This means they keep better than polyunsaturated oils but not as well as saturated oils. They are most appropriate for light cooking or used raw in salad dressings and the like. Oils that are predominantly monounsaturated include olive, avocado, peanut, sesame, lard and duck fat. When stored at room temperature, monounsaturated fats are typically liquid, but they are likely to solidify when stored in the refrigerator. Monounsaturated oils are generally considered to be the healthiest overall, but it's important to note that all three types have distinct advantages and disadvantages  not just for health but for flavor and culinary characteristics as well. Olive oil seems to have been anointed the "perfect oil" by some in the media, and while it is quite versatile, it cannot be all things to all cooks. Due to their unstable chemical structure, polyunsaturated fatty acids are more susceptible to rancidity than saturated and monounsaturated fatty acids, especially after prolonged contact with oxygen, light or heat. Oils that are predominately polyunsaturated include walnut, grapeseed, soy, corn, flax, hemp and fish oils. These are liquid at room temperature. Many experts don't recommend polyunsaturated oils for cooking because they are so easily damaged by heat. They are best used in their raw form, and used quickly at that. Never keep polyunsaturated oils beyond their expiration date. If cooking is necessary, use low temperatures. Polyunsaturated oils should be stored refrigerated in dark bottles. Saturated fats are the most chemically stable, giving them a long shelf life and the ability to withstand high cooking temperatures. Typically solid at room temperature, saturated fats are found primarily in animal fats and tropical oils. In general, animal fats such as butter, cream and tallow are predominantly saturated, however, two of the most highly saturated fats  coconut oil and palm kernel oil  come from vegetable sources. Furthermore, animal fats like lard, chicken fat and duck fat are predominantly monounsaturated, while fish oils are predominantly polyunsaturated. And it is interesting to note that the fatty acid composition of animal fat can vary depending on the diet of the animal. Animal fats have their place in the kitchen. Many believe that lard makes the best pie crust, and several traditional Hispanic dishes rely on lard for their distinctive flavor. Butter is the most common animal fat in the kitchen and good quality butters abound, as do cream and other dairy-based products used in cooking. Some producers are now creating high quality lard as well. Trans fatty acids are chemically altered, man-made fats found in partially hydrogenated oils. The hydrogenation process, in common use since the early 20th century, injects hydrogen into vegetable fats under high heat and pressure. This saturates what was previously an unsaturated fat and results in a chemical configuration that is not found in nature and is very rich in trans fatty acids. This is done to make vegetable oils, which are normally liquid at room temperature, solid and more chemically stable, thereby extending the shelf life of products in which they are used. Very small amounts of trans fats do occur naturally in some products such as milk, cheese, beef or lamb. Trans fats are doubly harmful because they lower HDL (good) cholesterol and raise LDL (bad) cholesterol levels, increasing the risk of coronary heart disease. In fact, trans fatty acids have an even worse impact on cholesterol levels than diets high in butter, which contain saturated fat. A 2002 report by the Institute of Medicine (a branch of the National Academy of Sciences) concluded that trans fats are not safe to consume in any amount.